Biomedical engineers at University of Toronto in Canada developed a simple, portable DNA diagnostic process using gold nanoparticles and requiring only small specimen samples. 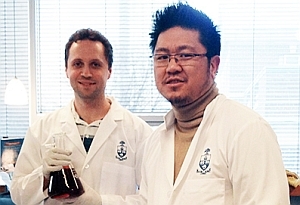 The team of doctoral candidate Kyryl Zagorovsky and professor Warren Chan reported their findings online in a recent issue of the journal Angewandte Chemie (paid subscription required). Zagorovsky extended that idea to devise a test for various diseases at once, with one small specimen sample, and with high accuracy and sensitivity. Like the home pregnancy test, Zagorovsky’s biosensor uses gold nanoparticles, but the nanoparticles are immersed in a DNA-based enzyme solution, binding the DNA to the gold. Current diagnostics using gold nanoparticles link the strands of DNA to the particles, and if the specimen sample contains the disease gene, that gene clumps together the gold particles, turning the test sample blue. The process developed by Zagorovsky and Chan can use much smaller specimen samples than current tests to return noticeable changes in color; one DNAzyme can test up to 600 links between target genes. As a result, the Toronto technique can test for multiple diseases in parallel, with a small sample of blood or saliva in one sitting. Zagorovsky and Chan took the process one step further, turning the liquid testing solution into a powder, making it lighter and easier to ship than a liquid solution, as well as giving it a longer shelf life. Those properties would make a powder-based diagnostics useful for efficient, cheap, over-the-counter tests for HIV, malaria, and other disorders in developing oountries.